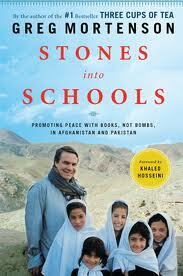 Yesterday I finished reading Stones into Schools by Greg Mortenson. A more inspiring book I have not read in a long time. He certainly takes you through an emotional roller coaster ride. This man has the single mindedness of a myopic bull. And boy is he successful at what he does – that is: help people. He is also, in my opinion an amazing administrator. He finds capable people in the most unusual places, gives them a chance, shows them what is needed and lets them get on with it. He is also ruthless in his pursuit of the good. One of the most uplifting parts of the book is that it shows how many really good people there are in the world and they can be found anywhere and everywhere.